Emily Boles, computer assisted instruction specialist with the University of Illinois Springfield Center for Online Learning. Research and Service (COLRS), was honored with the 10th annual Chancellor's Academic Professional Excellence Award (CAPE) on April 17, 2013. Boles' nominator describes her as “a highly skilled and valued member” of the COLRS team. She has become a trusted advisor to online instructors and regularly plans and teaches workshops on best practices and trends in online learning and educational technology. Boles is widely acknowledged as a national expert in online learning and has co-authored two book chapters and a journal article on the topic. She regularly presents at national conferences and workshops and is well respected by colleagues. “Emily is a highly valued member of our community. Faculty and staff have the highest regard for her talent, creativity, and leadership. 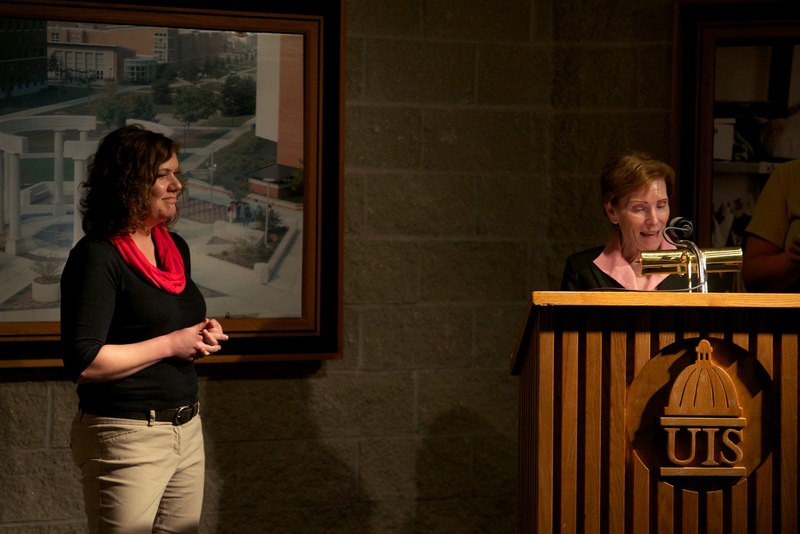 She makes herself available to assist people whenever they ask, to offer support, and to offer encouragement,” said UIS Chancellor Susan J. Koch while presenting the award. Boles leads the Continuing Education Online initiative and has been the lead instructional designer for the Emancipation Proclamation MOOC. “It’s really an honor to work with everyone in this room and on this campus. It’s such a vibrant community and nothing I do could be done without you,” said Boles. Others nominated for the 2013 CAPE Award include Donna Bettis, Chad Eversgerd, Jeri Frederick, Janelle Gurnsey, Carmalita Kemayo, Jim Korte, Tulio Llosa, Greg Mayes, Carly Shank, Natalie Taylor, and Bill Wheelhouse.